Here's a freshly finished doll, destined for my long-time friend and her new baby. Not quite sure how it fits with my other work, except that it is a collision of patterns and lots of colour. Anyhow, I thought I'd share it. 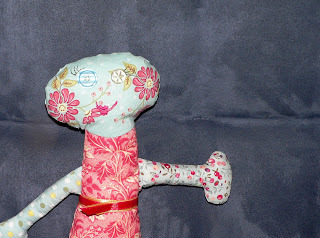 She looks cute - I have made a couple of softies this week too , which is not really what I usually do but fun for a change. BTW I found your blog via Dust - which I am also a member of.